Model last night was new. She shifted a lot during the 2 hour pose, but I didn't complain. It was pretty much impossible for her not to look good, no matter how her hair or body settled. 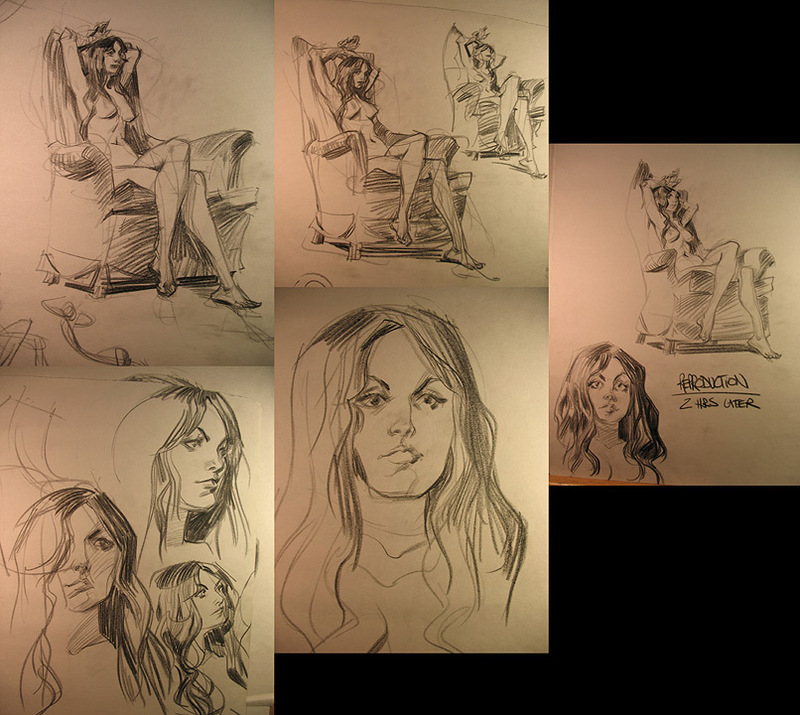 The drawing at the upper left is the first attempt -- made her too rigid. She needed to be sinking into that chair more (even though she wasn't). The drawing at the far right is me trying to remember as much as I could when I got home later that evening without looking at what I'd done. Great work, as usual. Thanks a lot for sharing. I find really interesting how you explain about your thoughts while drawing. Please, keep posting. The thing is 99% of the artists out there couldn't even begin to do a drawing like that without having the model there. I'm constantly amazed at how bad some of the invented work is of some really great life drawing teachers. They rock when working from life but working with no reference is a whole different discipline. I've met few people that can do both well. I think the invention part is far more telling of an artists ability. On that note check out this book: Figure Drawing: Design and Invention ~ Michael Hampton It's one of the best I've seen and I have lots of books. http://www.figuredrawing.info/index.htmlThere's a bunch of samples to see if you'd like it. Not sure who he actually studied with but this guy seems to combines Keven Chen, Glen Vilppu, Steve Huston and John Watkiss into a nice book. I totally agree about that. I do study at a classical atelier, but on the other side I study from Vilppu. At the atelier, when I show stuff done from imagination, I can´t believe that most people are amazed about figure drawing being done that way. I´m just dealing with simple volumes at this stage, with little bits of anatomy, still pretty simple, but showing some solidity. Thanks for telling about Michael Hampton´s book. I already had it. I saw some reviews and pictures at Amazon, and really liked how he simplified muscle groups, so I went for it. I haven´t gone over the whole book, but it seems to be a pretty solid book. Some of the drawings helped me to clarify some body masses.